Well hello. It’s been a minute (or five months)! With this being the first full week of the year, I conducted a 2018 postmortem; a time to reflect on the past year both personally and professionally. In 2018 I didn’t write and share recipes nearly as much as I wished I had. In part, the reason for my lapse is because I write and photograph food for my job, which in itself is a dream. But I just didn’t feel inspired after being immersed in food all day. I know, I know, poor me. Trust me, I’m not complaining. I’ve also been in deep grief over the loss of my father, which has put a damper on my creativity and drive. I had a lot of ideas in 2018, but no motivation to turn them into anything. I’m determined to change that in 2019. 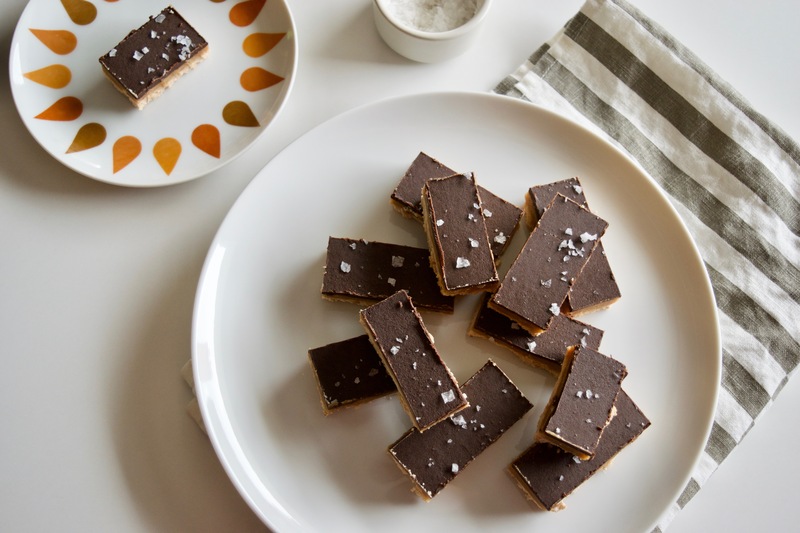 If you’re into healthy living as part of your new year plan, this dessert is for you. 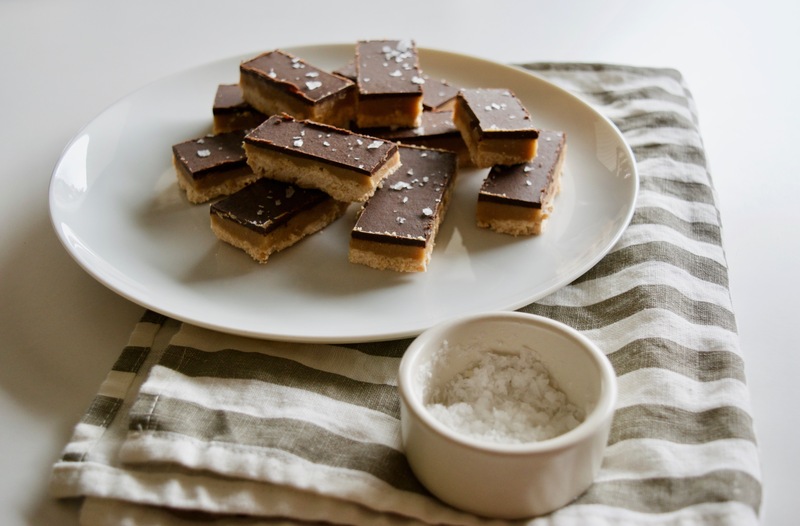 It’s my version of a Twix bar, and it’s gluten free, grain free, vegan and contains no refined sugar. I usually shy away from desserts that claim to be all of these things. 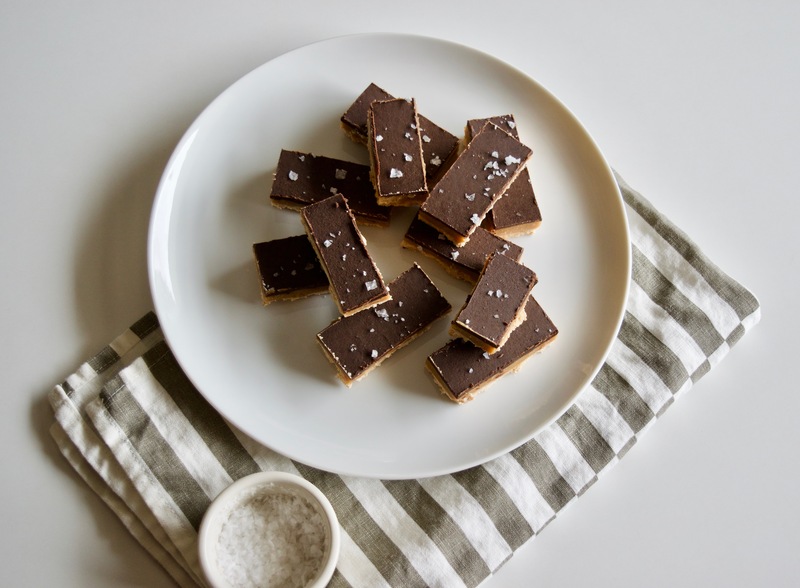 However, the combo of deep chocolate with ‘caramel’ filling topped with flaky sea salt is a sophisticated, grown up version of a Twix bar. If you’re looking for an exact replica of the Twix bar of your childhood, this isn’t the recipe for you. If you’re open to trying new things in 2019, this one’s for you. Unless you want coconut Twix, I suggest using refined coconut oil which has no coconut flavor. Put coconut flour in a bowl. Add the maple syrup and stir until fully combined and crumbly. Add the room temperature solid coconut oil and mix until a large dough ball forms, pressing out any clumps of coconut oil. I use my hands at the end to bring the dough fully together. For the filling, combine almond butter, maple syrup, coconut oil, vanilla extract and kosher salt in a small saucepan and heat until all of the ingredients are melted and throughly combined. Pour over completey cooled crust and let cool in the refrigerator until set before topping with chocolate layer. For the chocolate topping, whisk together melted coconut oil, cocoa powder and maple syrup in a small bowl. Pour mixture over the cooled caramel layer. Smooth evenly and let cool completely. Slice into 1-inch slices, or 16 squares. Keep stored in the refrigerator. Top with flaky sea salt before serving. Sorry about your dad, Lee. It takes a while to absorb and adjust.